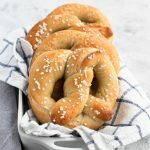 The Sourdough Soft Pretzels are a tangy, flavorful version of a favorite, classic treat. Fit your mixer with a dough hook, and in the bowl combine the flour, water, starter, brown sugar, salt, powdered milk, and yeast. Mix on low for 3-4 minutes until all of the ingredients are combined. Turn it up to medium and knead for 4-5 minutes, or until the dough is smooth and elastic. Shape the dough into a ball and place in a clean bowl. Cover with a clean towl and allow to rise until doubled. Depending on how active your starter is, this could take a couple of hours or 5-6. Once it has doubled, punch it down and then divide the dough into 6 equal pieces. Roll each dough piece into a rope, starting at the center and pushing them out while applying gentle pressure. They need to be about 36 inches long, but it will be easier if you roll them to 24 inches initially, then allow them to sit for about 5-10 minutes before finishing. The rest time allows them the gluten to relax and it won’t spring back when you try to roll it. Once they are all rolled out, create a pretzel shape by twisting the ends two to three times about a quarter of a way from the end. Bring the ends and twist down over the center of the rope, and drape them about an inch apart from each other on the center of the dough. Lay them out on a parchment lined baking sheet, sprinkled with flour to prevent them from sticking. Lightly lay a towel over them and allow them to rise for an hour to an hour and a half. The dough should be soft to the touch, but not so soft that it will deflate when handled. At the end of the rise time, preheat the oven to 375 degrees F and bring about three quarts of water to a rolling boil on high heat. Add in the tablespoon of baking soda (it will make the water fizz), and once it has calmed down, gently drop a pretzel in the water. Boil for 30 seconds, flipping halfway through, then remove the pretzel and replace it on the baking sheet. Repeat the boiling with each pretzel, and once they are all done melt the butter and generously brush it over each of them. Sprinkle with either salt or pearl sugar and bake for 20-25 minutes, or until the tops are golden brown. These are best eaten the day they are made, but can be gently reheated the next day and enjoyed. After an initial rise of 1-2 hours, you can place the dough in the refrigerator. However, the longer it sits, the more sour your pretzels will be, so keep that in mind when planning your mixing and baking times. I would recommend not letting it sit for more than 12 hours. Pretzels are traditionally covered with a special salt made especially for them. However, using large flaked sea salt is completely acceptable, and still tastes phenomenal. The pearl sugar is also a nice topping– it melts slightly during baking, leaving the pretzels with a lightly sweet glaze.